My sister comes home from the Leonard Cohen concert at the Point last week and tells me, "I have something that will interest you". She hands me a leaflet that members of the Irish Palestinian Solidarity Campaign were holding up outside the gig. The message aimed at Leonard Cohen was simple, it read please don't sing in Israel in large block capitals. The IPSC are urging the left leaning Cohen to abandon his planned concert in Tel Aviv next September. On the other side of the leaflet the IPSC had a more detailed message for Cohen, the gist of it reads as follows. Leonard Cohen, in your song Please don't pass me by you claim: I'm with the hunted, I'm with the maimed, I'm with the torn, I'm with the down. In the decades since then, Leonard Cohen, have you changed completely ? Are you now with those who hunt, those who maim, those who tear, those who put down ? I am blind, but you can see, I was blinded totally - so please, don't pass me by. In the decades since then Leonard Cohen, have you too been blinded ? Will you pass the hunted, maimed, torn Palestinians and sing in Tel Aviv ? Will you let your performance be exploited as propaganda by a state that disinherits the Palestinians, destroys their homes and their hopes, strips them of their rights, occupies their land, locks them without trial in hellish prisons, kills their wives, their husbands, their children ? 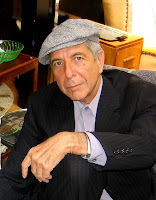 If you sing in Tel Aviv, Leonard Cohen, you will not be singing for the Palestinians in Gaza, a stone's throw away from where you sing, because these tortured, dispossessed people cannot leave their open air prisons to hear you sing. You will be passing them by, as if you were blind, blinded totally, although demonstrators on streets all over the world are striving to open your eyes. Ok, let me try to explain what is wrong with this. Boycotts aimed at Israel will not affect their policies because they care far more about their security than they do their image. All boycotts will do, particularly a cultural boycott is isolate the Israeli people. At a time when dialogue between people is needed more than ever the Palestinian Campaign for the Academic & Cultural Boycott of Israel PACBI would have us shun the entire Israeli nation, embittering them in the process and making them less likely to ever accept a peace deal that requires Israel to trust the international community. I went to Israel in 2004 to watch the boys in green take on Israel in a world cup qualifying match. 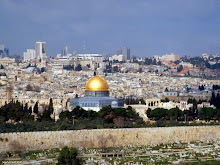 I saw the Israeli people who do not want to be defined solely by the conflict. I saw a people that want to live a normal life. I saw fathers and sons attending a soccer match together. And I had some fascinating conversations with many Israelis about Judaism, Israeli history and politics. But if the IPSC had there way then none of this would of happened. That is why I say, Leonard Cohen, please do sing in Israel. The thing that jumps out at me most from the contents of the leaflet is the claim that the people in Gaza cannot attend the concert. Of course they can't, Israel is at war with Gaza. However, Leonard Cohen being the all inclusive and enlightened man that he is did plan a sister concert in the West Bank town of Ramallah. Unbelievably the concert was cancelled by the Palestinian organisers under pressure from the PACBI who were angered at Cohen's decision not to abandon the Tel Aviv gig. So in these people's eyes playing a concert in both Israel and Palestine is still being too unfair to the Palestinians. I disagree, Leonard Cohen, please do sing in Israel. The tone of the lecture is also interesting. Its like the IPSC and PACBI are offended that a left winger like Cohen is not as anti Israeli as they are. Well I have been saying this for ages. There is nothing incompatible with being a human rights activist, an environmentalist or a trade unionist and expressing admiration for aspects of the Israeli state. 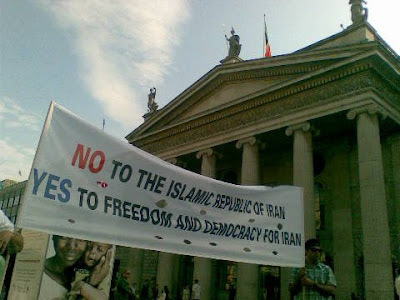 People may have problems with Israel as I do but it is a legitimate democratic state. It deserves a certain amount of respect. 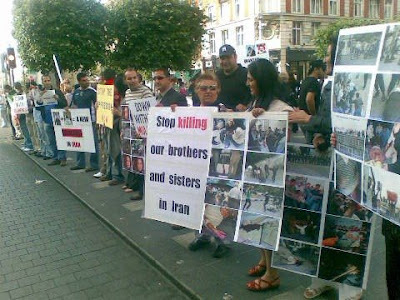 I have no problem with someone calling for a boycott of the Israeli state so long as they are consistent by calling for more intense boycotts of the scores of African and Arab states that butcher their own people on a far worse scale than anything the Israelis do in the occupied territories. Leonard Cohen knows this and this is why he will ignore the Israel bashers and go ahead with the Tel Aviv concert. Here is some of the man himself, just cause I like him. There have been a couple of interesting articles in The Irish Times in recent days about the similarities between the Northern Ireland and Arab Israeli peace processes. The most interesting of which was written by Northern editor Gerry Moriarty and was entitled Oslo for slow learners. This is of course a brilliant play on the famous words of SDLP legend Seamus Mallon who described the 1998 Good Friday Agreement as Sunningdale for slow learners. Allow me to explain. In 1973 the Sunningdale Agreement was signed between the Irish and British governments. It created a power sharing executive in Belfast and included a north South dimension which enabled the new Belfast government to meet with the Dublin government to discuss all Ireland issues. Unfortunately however the agreement collapsed after six months due to massive opposition from loyalists who believed that Sunningdale was a conspiracy between the IRA, the Irish government and the Church of Rome to unite Ireland and destroy Ulster protestant culture. It would take another 25 years and cost some 2000 more lives before another agreement would succeed where Sunningdale had failed. The only thing is, when it eventually came in 1998, it was virtually the same as Sunningdale. Hence Mallon's immortal words which in my opinion, bring shame on all the rejectionists, extremists and pessimists who opposed peace or said that it could never be achieved. 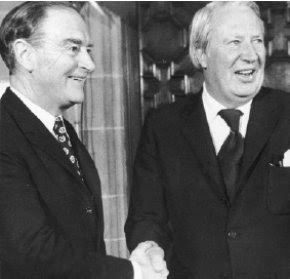 Former Taoiseach Liam Cosgrave congratulates former Prime Minister Ted Heath after the signing of the Sunningdale Agreement in 1973. Incidentally everybody assumed that the former Taoiseach who keeps a very low profile was dead until he showed up yesterday at the council of state meeting to fulfill his constitutional obligation. Good to see the old coger hanging in there. The article by Gerry Moriarty was excellent because as he points out, when peace is eventually achieved in the Middle East it will be some variation of the 1993 Oslo accords. The concept of land for peace is still valid today and as I have often said here, possibly on a grander scale that ever before. Comparisons between Northern Ireland and the Middle East are valid despite what many hard liners say. The most important comparison is I believe the fact in both cases, most people said peace would never happen. It is also worth pointing out that George Mitchell and Tony Blair, two men who played key roles in the Northern Irish peace process are now deeply involved in peace making efforts in the holy land. These men will not be deterred by rejectionists who seek a winner takes all solution to the conflict. A group calling itself the Eagles of Bashir said it seized staff from the Belgian arm of Medecins Sans Frontieres in north Darfur in March. Another group, calling itself the Freedom Eagles of Africa, said it abducted staff from Aide Medicale Internationale in south Darfur in April to demand Paris retry members of Zoe's Ark, a French humanitarian group, convicted but later pardoned over the abduction of children from Chad. The abduction of these two Goal workers is obviously a similar stunt. In the previous cases all those kidnapped were returned safely so one must remain optimistic. There is no doubt however that this is a great illustration of what a truly vile but typical regime this is. Khartoum basically got a gang of terrorists to do its dirty work for them. Omar Al Bashir is obviously watching with concern the fate of Liberian scumbag Charles Taylor who is sweating in The Hague on charges of crimes against humanity, the first African head of state to be brought before the ICC. Here's hoping that one day Al Bashir will meet a similar fate. 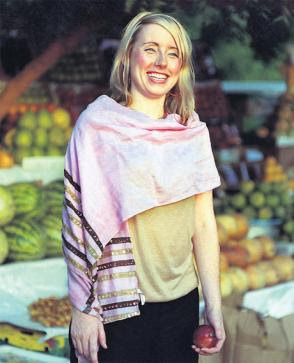 In the meantime I will keep my readers informed as to the progress of Irish efforts to have Sharon Commins released unharmed. 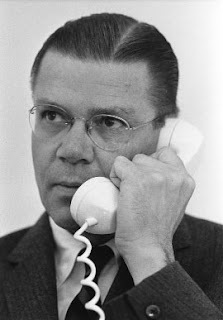 Former US secretary of Defence Robert McNamara died on Monday aged 93. McNamara was a fascinating man who lived an amazing life. He was the top man at the pentagon from 1961 to 1968 during the Kennedy and Johnson administrations. To put it another way he was the secretary of defence of the United States before the current President was even born. He was there for it all, the Cuban missile crisis, the Kennedy assassination and the escalation in Vietnam including the hugely controversial Gulf of Tonkin incident. Of sound and sharp mind until his death McNamara regularly offered his ring side view of these events to the public. A brief synopsis of his life reads like a summary of the 20th century. Born in June 1916 he claims to remember the World War One victory celebrations in his San Francisco neighbourhood. While working on a ocean liner during his college years he witnessed first hand the Japanese bombing of Shanghai in 1937. An exceptionally intelligent man he became the youngest ever assistant professor at Harvard in 1940. During World War Two he joined the US Air force where his talent with numbers and statistics were put to use with the AAF's Office of Statistical Control. He was deeply involved in the planning and execution of the strategic bombing of Japan. I doubt there is anybody living today who held such a high level role during the second world war. After the war he worked for Ford Motors becoming President of the company in 1960, the first man outside the Ford family to do so. After he left the Pentagon in 1968 he became President of the World bank until 1981. Since his retirement he has taken many an opportunity to discuss his unique experiences and insights into what right and wrong with the world. However what I found truly unique about the man was not simply his interesting life but the way he tried in his later years to bridge the gap between the policy makers of US foreign policy and the general public. McNamara spoke honestly and openly, without any political spin about his motives during his time at the pentagon. Most notably in the magnificent 2003 documentary Fog of War McNamara articulated in lay mans terms why and how America fight its wars. Some believe he was seeking atonement by doing this as he was after all the architect of Americas most disastrous war. I disagree. I think he was, by participating in the documentary, attempting to inform public opinion of the realities of international relations in the hope that by learning from his experiences, future wars could be avoided. The best example of this was his 1993 meeting with the former North Vietnamese foreign minister Nguyen Co Thach. As McNamara explains in Fog of War it was one of the very few examples in history of two adversaries from the highest levels meeting up after a war to discuss what might have been. In the heated exchange Nguyen Co Thach insisted that the North Vietnamese were fighting to resist American enslavement. 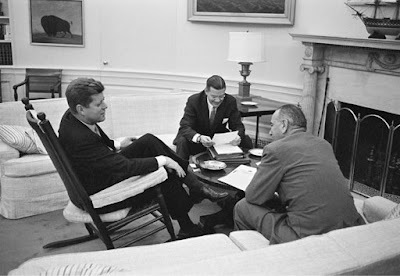 McNamara insisted Vietnam could have had Independence and reunification in the very first place if they had of been prepared to offer a solid guarantee that they would resist Chinese and Soviet influence. Nguyen Co Thach accused McNamara of understanding nothing of the proud Vietnamese nation. If he had he would know that the Vietnamese could never be pawns of Moscow or Beijing. They had in fact been fighting the Chinese for thousands of years. "We would never be pawns of anyone" he claimed. In Fog of War McNamara conceded that neither he nor Presidents Kennedy and Johnson appreciated this aspect of the Vietnamese people. This was in sharp contrast to the Cuban Missile Crisis which had a more successful outcome. A special advisor on the USSR to Kennedy suggested that the way to get the Soviets to back down was for the President to give something to Kruschev that he could sell as a victory back home. Allow him to say, I saved Cuba, I saved Cuba from a Yankee imperialist attack. This came in the form of a US guarantee not to invade Cuba in exchange for a complete withdrawal of the missiles. It worked and nuclear war was prevented. Empathising with a potential enemy in order to avoid conflict is one of the main lessons McNamara claims should be learned from his experiences. Robert McNamara led an extraordinary life and it is to the benefit of the world that he chose to articulate his experiences so effectively. From World War Two to Vietnam and the wider Cold War there are few whose lessons are more worth listening to. Many people detest him, apparently many Vietnam veterans are among them and I suppose they are entitled to feel that way. I for one however admire the way he spoke out in recent years and used his intelligence and experiences to help future generations not to make the same mistakes. 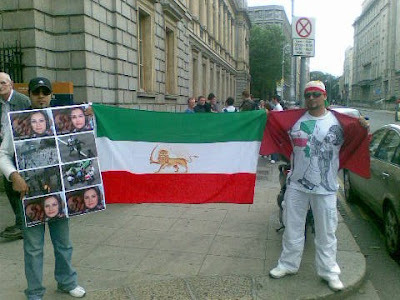 I took the following photos of anti regime demonstrations in Dublin. 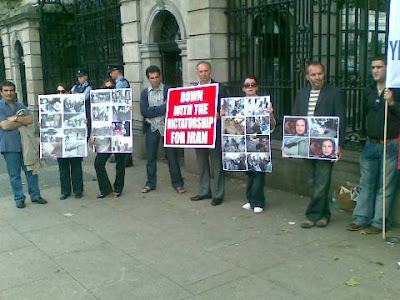 Several hundred Iranians living here along with concerned and angry Irish such as myself took to the streets to condemn the regime and to call on the department of foreign affairs to expel the Iranian ambassador. 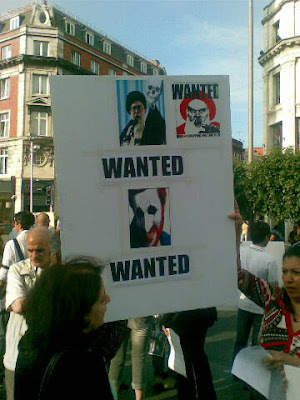 Ahmadinejad as the joker, love it.